Loaded (known as Blood Factory in Japan) is a science fiction-themed top-down shoot 'em up video game that was developed by Gremlin Interactive and published by Interplay. 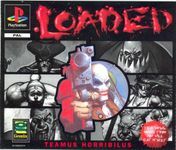 Loaded was released in late 1995–early 1996 (around New Year time) on both the PlayStation and Sega Saturn. The game had origins in DC comics and more notably the more adult-orientated Vertigo Comics, and there was a small graphic novel based on the game. The six playable characters of the game are a combination of villains, anti-heroes, psychopaths, perverts, mutants, and flamboyant murderers. They are, however, the last hope to stop the intergalactic supervillain code-named F.U.B. and save the universe. The characters were created and designed with contributions from Garth Ennis of Vertigo Comics and Greg Staples of 2000AD. Later in the same year the game spawned a sequel using almost entirely the same characters and the same game engine, albeit one with mildly improved graphics, named Re-Loaded. Re-Loaded was released on the PlayStation and PC at the end of 1996. Although it did not enjoy as good sales as its predecessor, it did however have an acclaimed soundtrack which included music from Pop Will Eat Itself (as did the first game) and the game discs of both games could be played as audio CDs. Both games were notorious for their macabre sense of humor, over-the-top violence and extreme gore. The game features levels across fifteen different worlds and has six playable characters: Mamma, Fwank, Bounca, Vox, Butch and Cap'n Hands. Two characters may be selected in co-operative mode to complete the game. A mission briefing will begin at the start of every mission, aided by a full motion video sequence. Loaded's gameplay is similar to that of Gauntlet, which requires the player to move room to room killing everything in sight, everything of which will try to kill the player also. Score can be increased by looting the bloodied remains of enemies. There are some puzzle and exploration elements, and power-ups and ammo can be found. The levels progress by collecting keycards capable of unlocking doors. The player can zoom in to their character by pressing R2, or zoom out by pressing L2. At the end of each level, the game tallies the player's greed factor, accuracy and body count on a 0%-100% scale in order to give the player's career prospects (ranging from as low as "social worker" to as high as "genocidal maniac", etc.) and final score.